[Speed Hypnosis (Mind Control Tool)] Psychic: Season 1, Episode 4. The easiest way to best categories Hypnosis is into 2 parts: 1) Clinical Hypnosis and 2) Entertainment Hypnosis. Clinical Hypnosis is generally practiced to help calm patients, reduce pain during surgeries, quit a habit (smoking, masturbation, OED, etc), overcome a dramatic trauma (physical abuse, fear of dogs, etc) and much more. Very often, a session can last for about an hour and patients are brought to a very deep state of hypnosis that is very similar to a deep sleep. In comparison to Clinical Hypnosis is Entertainment Hypnosis (a.k.a. Stage Hypnosis) and no it doesn’t involve a swinging pocket watch. It is in fact much more challenging and will require a professional hypnotist with experience. During the performance the hypnotist will need to be mindful of the entertainment segments and the well-being of the participants. If not handled professionally, participants may hurt themselves or in rare cases suffer prolong effects of hypnotic stress (epileptic seizure, paradoxical laughter, pseudobulbar affect and etc). The use of hypnosis during the earlier days weren’t so sunny. In the 1950s, the CIA funded a top secret illegal mind control project with its code name known to be as MK Ultra. Hypnosis along with drugs (LSD, amphetamine, etc) and other methods were used during the experiment to manipulate the minds of their human test subjects. Hence, it possible that the term Speed Hypnosis (Speed is the street name for amphetamine) was coined in relations to MK Ultra and to describe a quick hypnosis technique. Speed Hypnosis was later known as Rapid Hypnosis to break away from its dark history. Other terms to describe quick hypnosis technique were later used to commercialized by hypnosis coaches. In Episode 4, Alvin Terence lead his participants into a trance-like state in heightened focus and concentration. While in a trance like state, participants were put into several state such as catatonic (immobile), mutism (unable to talk), amnesia (lost of memory) and confabulation (having memories of the wrong information). So how was it done? We can all generalize the technique as Hypnosis but to be specific, the psychological technique used in the video was PWA or Perception Without Awareness. In short, PWA is a manipulation technique to control either by manipulating the stimulus conditions or by instructing observers on how to distribute their attention. For an example, if someone whistles at you from a distance maybe because you were distracted or focused on something else, your brain stores that action (whistles) and response to it at a much later timing when that distracted is removed. Thus, causing your mind to either have to urge to whistle or hum to a melody. At the 7.12 minute of Episode 4, a red arrow have been conveniently used to point out a physical touch stimulus to influence the participant. The sense of touch is located in the skin. It comprises of three layers, starting from the surface to the inner: the epidermis, dermis, and hypodermis. Different types of sensory receptors, varying in size, shape, number, and distribution within the skin, are responsible for relaying information about pressure, temperature, and pain. Pacinian Corpuscle is the largest touch sensor located in the hypodermis, the innermost thick fatty layer of skin, which responds to vibration. Between 5.09 min to 6.01 min, Alvin Terence distracted the participant with several hand gestures while at the same time implanting the new name “Sharon” by writing “Sharon” behind the right shoulder. 1) Instruct your friend to stand near you. 2) Put your own hand over your friend’s shoulder. 4) While explaining in Step 3, start to draw circles with your ring finger behind your friend’s back while at the same time rock their body. Please note to use the ring finger (4th finger) as it is the weakest finger and doesn’t being much attention to the drawing. The rocking of body helps make the drawing less suspicious. For more unrevealed techniques of Psychic: Season 1, be sure to check out the DVD under the ‘Online Store’ section on our official website, http://www.MagicATOM.com/psychic. [Time Traveling Prediction/Prophecy] Psychic: Season 1, Episode 3. With that scientific explanation, we can conclude that Time Traveling is possible… but only in theory and not Interstellar-ish. Unless you can travel at the speed of light, which is of course impossible because it takes infinite energy to accelerate an infinite mass. In Episode 3, Alvin Terence successfully ‘Prophesied’ or (with a less supernatural theme) ‘Predicted’ random words selected by the participants. The participants were instructed to visualize pages of a dictionary flipping and then select a random word from one of the imaginary pages. Lastly, the random word was highlighted or circled. After revealing the choice of random word(s), Alvin Terence directs the attention to an envelope held by the participant at the very beginning of the experiment. Inside the envelope reveals an IKEA photo frame with their choice of word. So how was it done? Here is one of the techniques use in Episode 3: Pinstriping Pareidolia. Pareidolia combined with Pinstriping (line art) can produce ambiguous words only imaginable by creative minds. Were you able to see the words written clearly on the photo frame or was it your mind telling you what you saw? One of the important rules in magic: PRACTICE to perfect a trick. It doesn’t matter if you’re a bad presenter because you’re still mystify the audience. However, if you expose a trick from a bad performance than you’re no longer a magician because you fail to mystify the audience. A real magician is able to capture the minds, hearts and smiles of the audience. David Copperfield has been inspiring magicians around the world. Here is a talk show feature of Copperfield inspiring magicians. I must watch for magicians! As promise here is the current update of Luna Mentalist from Indonesia Mencari Bakat 2014. The Magic Life – Documentary Trailer from Nelson Cheng on Vimeo. On 6 June 2014, Singapore lost one of the most multi-talented entertainers of all time, Victor Khoo. He was 63. Victor Khoo (Victor Khoo Kah Liang), born on 7 October 1950, passed away on 6 June 2014 from a long battle with cancer. Victor was known during the 1970s and 80s for the voice behind children’s radio show Happy Talk. In the entertainment industry, Victor was well known for his hilarious ventriloquist act and for being a successful multi-talent entertainer (magician and compere). Victor Khoo’s funeral wake will held at St. Teresa Church Parlour, No: 510 Kampong Bahru Road, Singapore 099446. Cortege leaves on 9/6/2014 at 1.00pm for funeral mass at St. Bernadette Church and thereafter for Mandai Crematorium Hall 4 for cremation at 3.45pm. Below is a video featuring the Top 10 Famous Magicians! We are not sure how they come up with that conclusion (probably through the number of Google search results), but here’s an article which talks about the success behind magic and influence as well as Zen Stare that most successful magicians have! Take a look the video below and see if you can spot any sleight of hand. Don’t worry if you didn’t on the first run. Most of us didn’t either until we watched the slow-mo version. That kid definitely has potential to be charming magician. Go heartbreaker! Astonishing Team of Mentalists (ATOM) is a team of internationally performing artistes from Asia. 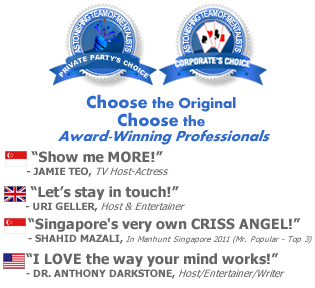 Formed in 2007, the World's FIRST & ONLY multi-talented team of Psychological Illusionists (or Mentalists) has performed for the local biggest names ranging from Politicians, Celebrities and highly reputable Corporate Clients. ATOM Official Blog aims to foster the spirit of Mentalism (the toughest sub-category of Magic) through World Magic News and ideas. It's catered for EVERYONE not just Mentalists or Magicians. The authors contributing to this blog are members of ATOM. More information of the authors can be found on ATOM Official Website below.